Oh, the Wild Kratts party is finally over!!!!! It was a huge success, at least that is what I can tell from the kids at school who see me and say "Mia's mom, it was the coolest party ever!" We are totally exhausted but so worth it. No matter how far in advance you plan a party, you are always rushing at the last minute. My legs are still throbbing, let me tell you. Anyway, party pics are coming soon, together with pinata instructions and some cool stuff like food signs. 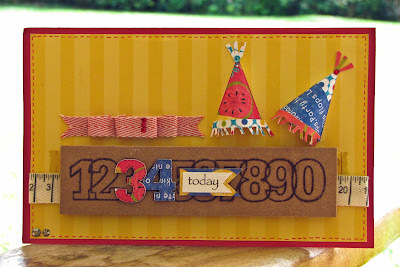 But today, I'd like to share with you a card I created for Practical Scrappers' birthday cards feature. I love these hats, and I love the stamped numbers, too. Lucky I had someone turning 34 to give it to! I will be leaving Practical Scrappers soon and my heart is aching, I will certainly miss this absolutely fabulous and talented team. I really can't do everything I wish I could do, however, and I can't stay in a team and not give it 100%, so it is time to at least take a break. They are having a Design Team call at the moment, and if you are looking for a site where you will be working with fabulously talented people who encourage you to be creative and support you every step of the way, then this is the right team for you. You can click HERE for more information. Yes, I know, I can't wait for you to see it all either, but all I can say is you will LOVE it! There are so many different classes for all interests and levels I am sure you will find something that is just perfect for you. 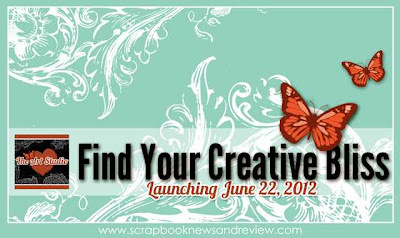 And if you don't want to miss all the giveaways and special things coming with the launch, you need to visit Scrapbook News and Review and register today. You don't have much time left!